Is a Content Management System Necessary? - Wood Street, Inc.
A content management system, or CMS, is software that allows you to create, edit, and publish content to a website or blog without advanced coding knowledge. In other words, a CMS makes it possible for you to update the content on your website without needing HTML or other coding skills AND without relying on a vendor to make the updates for you. A CMS uses a WYSIWYG editor for updating content the majority of the time. WYSIWYG stands for What You See Is What You Get. Making updates and adjustments to your content is a simple process. And adding images, video, and PDFs is as easy as selecting a file from your computer or website. Why is this so important? Because content is still King! Your online marketing strategy needs fuel and that fuel is your content. Eliminate the roadblocks and your content efforts will flourish! A successful business today must have a content strategy. Content is what your audience is looking for. Content is what the search engines use to index your site. It’s what sets you apart from your competition. The problem with this is time. Does this person have the time to make updates to your website quickly and accurately? What is the rest of their day spent doing? Is this their real job or just a distraction for them? Of course then there is the issue of them leaving. Who will take their place? Yes, we are one of these. We do make updates for our clients and for the most part, we are able to do this quickly. However, we tell our clients all the time that we would prefer for them to make content updates themselves. Why? Isn’t this costing us money? No. If you have a CMS in place, you’re more likely to keep your content fresh. Making content updates means your site will perform better as a marketing tool. Your website is a success and we had a part in that. Who will give us more repeat business and better referrals? The company with the successful website built on a CMS? “I’ll take door number two Chuck” … Correct! What Are My CMS Options? There are lots of CMS options available. Cloud based CMS options are great because users with a secure login can access the site and make changes from anywhere. This expands your content management solution well beyond one machine, one desk, or even one person. You’ll want to have some security precautions in place. Right now we only recommend two content management systems. Both are open source systems built in PHP. More often that not, our recommendation is WordPress. WordPress has evolved from a blogging platform into a full-fledged CMS. The system is very easy to use. There are tons of available plugins and lots of designers and developers work with it. Problems with WordPress usually involve pre-built themes. These are great lower cost solutions. But, I would recommend using an expert to help you choose the right theme and make updates to it. The theme choices available can be overwhelming. And once you’ve chosen a theme, you have to know how to set it up. It’s rarely a plug and play scenario. Pre-built themes are not a bad thing. You simply need to either know WordPress or have some help to set them up the way you want. For something more custom, I would recommend you have a web design and development firm (like Wood Street) develop a custom theme specifically for you. Our second choice is Drupal. Drupal is a robust CMS solution often used when there is a large membership database or other complex functionality involved. Unfortunately, the system is not quite as user friendly as WordPress for the content manager. Drupal development is also a more specialized skillset so finding support is not quite as easy as it is with WordPress. Sometimes the constraints that exist with the WordPress or Drupal platforms might make them bad choices when developing a highly customized web solution. For example, when we developed the STAR Rating System – the nation’s first framework and certification program for local sustainability – the requirements were so specific and complex that an off-the-shelf CMS solution was simply not an option. We had to build the system on a base open source CMS that we then customized to meet its functionality needs. iMIS is a great example of this, one of the leading association management systems out there. They also have their own content management system which ties into all of the other features you have with your version of iMIS. But, as we’ve seen time and time again, it does not always include everything you want. Your only option then is to pay iMIS to make the changes you want. This is not cheap. There are other solutions out there like Wix and SquareSpace. These are not open source. These you have to pay for. And you build your site within their closed system. Due diligence in contracting really applies here. They’re fine for companies starting out but what happens when you are ready for phase 2? You have to start from scratch. The web is constantly changing. There is new information available every minute of every day. Where are you in all of this? To keep pace with the needs of your audience, you need to eliminate any potential log jams. With a CMS in place, you will be able to focus on your content strategy and the updates will simply be a small part of that process instead of the bulk of it. Enable your team to succeed. Give them the tools they need to keep the content process as fluid as possible. 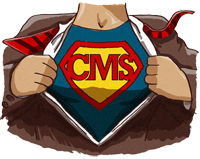 Do you have a CMS? What are your thoughts on this? Let me know below.